What Applications Require a High-Speed Right Angle Gearbox? Reliability is crucial for any industrial equipment, but most of all when machinery is operating under high-speed, high-torque conditions. For these applications, a high-speed right angle gearbox is often the best design choice to ensure cost-effective, long-lasting, safe performance. 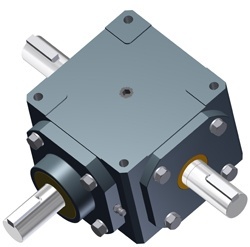 Right angle gearboxes are also compact, an important advantage when space limitations are a design factor. High-speed automation is common in applications such as packaging, bottling lines and other food processing operations, pulp and paper manufacturing, heavy manufacturing such as cement or steel, and mining. And locations such as car washes, food and beverage operations, or medical facilities typically use high-speed roll-up doors. Which High-Speed Right Angle Gearbox is Best for Your Application? For some types of applications, you will also want to specify the acceptable amount of backlash (space between two meshing gears). This assures optimal lubrication, so the gears won’t lock up. Despite their small size, spiral bevel gearboxes can handle high torque and high speeds thanks to their curved teeth. The teeth meet at a 90o angle, but their curved shape improves traction and flexibility and allows for better, more consistent lubrication. The result is smooth, quiet, enduring operation with little risk of overheating. W.C. Branham makes hollow bore spiral bevel gearboxes and also two-way, three-way, and all-way models. We also make units that offer Continuous Recirculating Lubricant for continuous duty and high cycle applications, and stainless steel gearboxes for wet, corrosive, or otherwise hostile environments. Although you can spec multiple configurations using our standard options, custom design may still be your most effective solution. Especially under high-speed, high-torque conditions, you need gearboxes that precisely match your specifications. A unit that is “pretty good” won’t be good at all in the long run. No worries, though, our engineering and design pros are always looking for another good challenge. So, whether you’re sure you need custom design, or you’re stumped on a spec’ing detail, give us a call.